You entitled your afterword to Punto d’Ombra “Una mappa del mondo,” and your photographs were made on six continents. 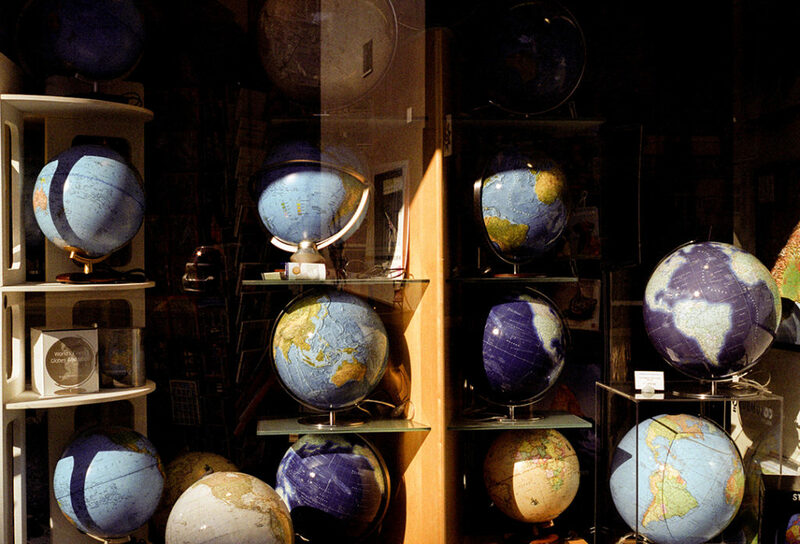 So could you talk more about your concerns with geography and maps in your work, as well as the influence or inspiration of Calvino, Ghirri, and other Italian artists who’ve embraced this notion of work as a map of the world. That’s a wonderful and new to me quotation from Calvino. I am looking at my calendar as I write this response. I was in Brooklyn when you wrote, and I am back there now, weeks later, writing back to you shamefully late. In the interim, the map has been my life. I have been in Italy, Malta, and Ethiopia, looking at GPS coordinates, tracing the shoreline from the plane as it approaches. Italy was most intense of all, a country I first visited about eight years ago, but which I’ve now returned to many times. (In contrast, I’ve been traveling to Belgium, Holland, and Germany for study since the late 90s. They are more deeply familiar to me.) On this trip, I was in Rome and Naples, in Sicily and Lombardy and Tuscany. Long worried that Italy is a cliché, I have begun to find what the light can say directly to me there, I have learned to see the history as well as the imperfect modernity. And your question bears an exact insight: my interaction with Italy, my growing love for it, is strongly bound to photography. Was it by coincidence that I wrote an article on Luigi Ghirri while I was in Italy? Or that I experienced its landscapes through my own vision, but also through the vision of Ghirri, and Giovanni Chiaramonte, Guido Guidi, and Gabriele Basilico? Or that these are artists who are all particularly sensitive to terrain, who are, in a sense, all photographic cartographers? 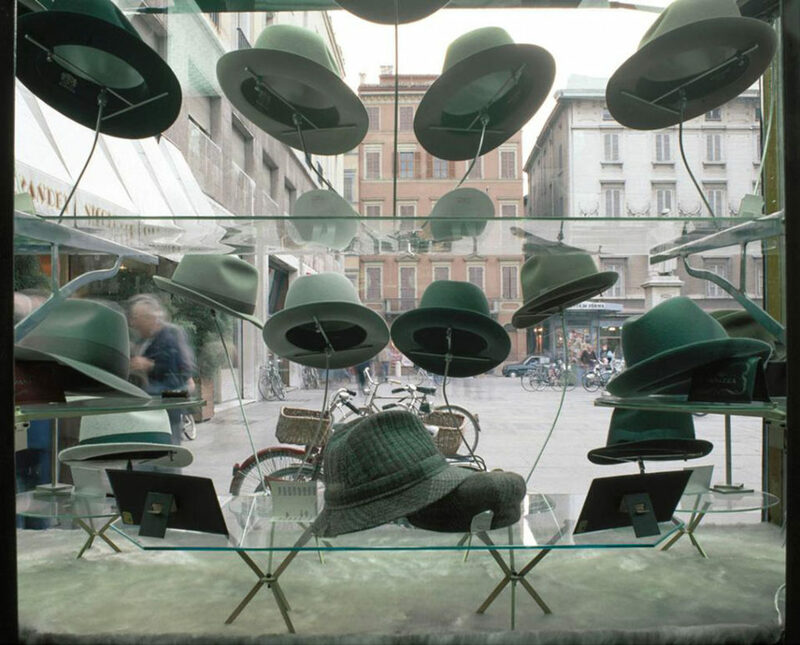 Or that my first large solo show was in Italy and my first photographic monograph was in Italian? I suppose I feel the place has seduced me, won me over. Finally, what artists do for us is similar to what places do for us: they provide an interpretive key for what has been internally latent all the while. Italy is becoming one of my special places, one of my places of self-recognition. Now, for you, I know that Italy has special meaning too. Your work has been shown there, you go there often. But let me extend the question slightly and ask what the role of terrain is in your work. 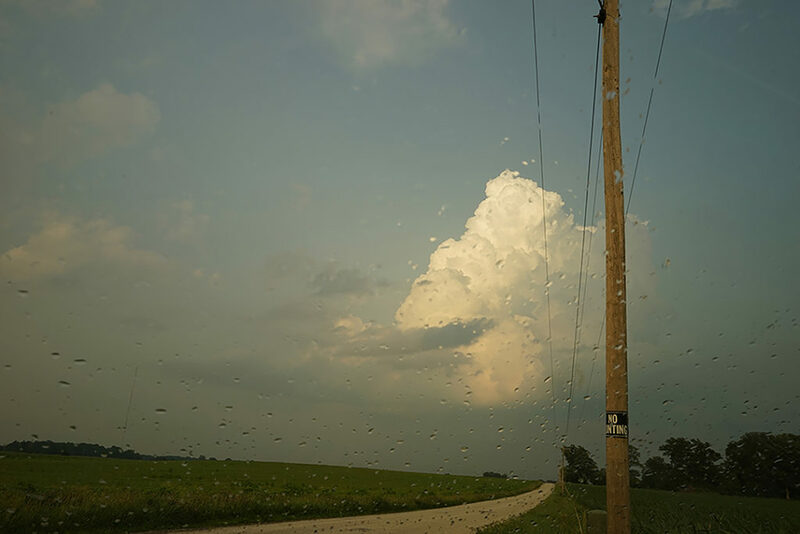 You don’t really do straight landscape photography, but I’ve seen some of your recent pictures from Indiana, and they seem to me to be imbued with a feeling of land and belonging. I don’t really feel completely at home in any landscape: Italy does one thing for me, Nigeria does another, Switzerland does another. What about you? Is Indiana a place of repose for you? Is Italy? What does landscape mean to you, personally and photographically? Certain landscapes—especially places where I’ve lived or often visited like Italy—call to me. Sometimes it’s because they evoke memory or poetic associations. Sometimes it’s the quality of the light. Sometimes it’s something too elusive to put my finger on, at least initially. All I know for sure is that when a landscape calls, I follow. Over the years, I’ve learned to have faith in working this way: photographing—and sometimes writing—spontaneously, intuitively, and patiently in the landscape, accepting that it could take months or even years before I fully grasp what a landscape is trying to say to me. It’s a process filled with frustration and doubt. So, to bolster my spirits along the way, I often revisit the work of artists who share a similar preoccupation with geography, such as Luigi Ghirri, William Christenberry, or Elizabeth Bishop, a poet we both admire. Recently, I came across this marvelous story about Bishop as a young poet. At the end of a lengthy trip to Italy, she insisted on bringing several small owls along on the voyage home. I can just picture Bishop’s cabin with those owls swaying on their perches to the rhythms of the Atlantic Ocean. It’s no surprise that the owls—one a gift for her friend and mentor Marianne Moore—were seized by U.S. Customs. But it’s not hard to identify with her impulse. For don’t we all long to return from our travels with something resonant, something lyrically alive with a place that stirs something deep within us? 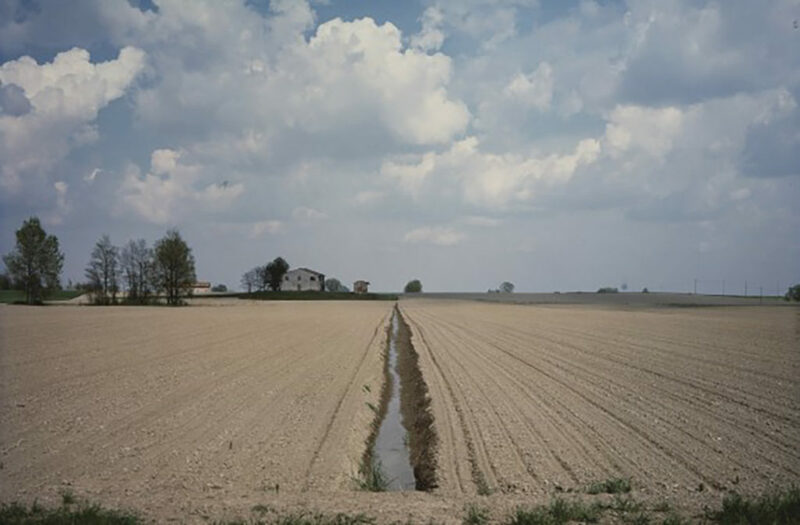 Lately, I’ve been revisiting a landscape that often brings to mind Ghirri’s photographs of the agricultural Po Valley. I’ve been retracing the route of my country doctor father’s house calls through the Indiana farmland where we both were born. Following his work rhythms, I photograph often at night and in the early morning, when most people come into the world and most people leave it. Driving half-asleep through this gently rolling countryside, I find myself drawn again and again to certain images—covered bridges, floodplains, and, in particular, sycamore trees, whose freckled bodies remind me of my father. For this work-in-progress, Night Calls, I’m slowly and painfully learning to accept, is my way of coming to terms with the inevitable loss of my kind, scientific, and insightful father, a quiet man who’s taught me much about life and death and love of the natural world. Perhaps fittingly, Night Calls has evolved into a kind of farewell to him, as meandering as the Big Blue River we often traveled along, as lingering as many a reluctant goodbye. Italo Calvino once wrote that there are two kinds of creative process—“the one that starts with the word and arrives at the visual image, and the one that starts with the visual image and arrives at its verbal expression.” For Calvino, the image came first, triggering a story or novel. As you can see with Night Calls—and the same was true with My Dakota—my photographs tend to lead the way, and the words eventually follow. How about you? With Punto d’Ombra, did the words usually come first or the photographs? Or did you work both ways? Or perhaps you use an entirely different map to navigate this new world of work that interweaves an author’s photographs and words? A confession first: I’ve never attempted to travel with owls! But I love that not only did Elizabeth Bishop do it, but when one hears the story, it’s not at all surprising. And I think that when we are working on a project, there are moments of charge or spark or sublimity that really make the other moments resonate. 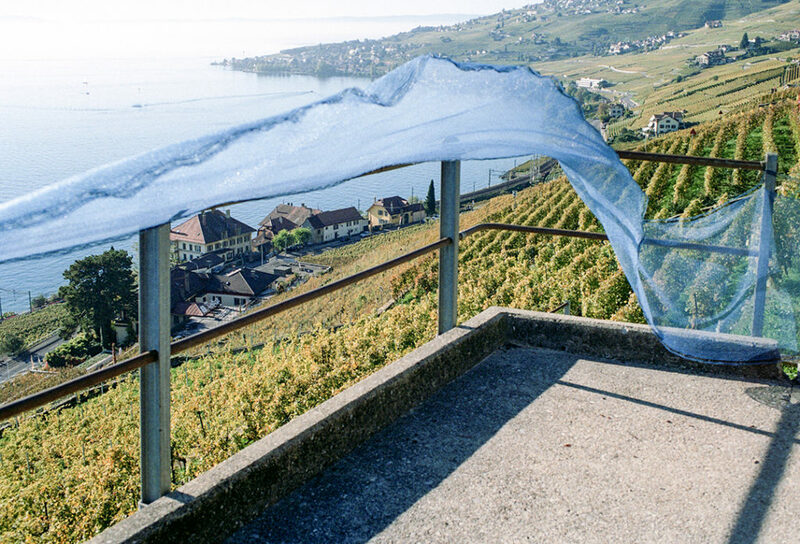 For me, one of those moments was a photograph I took on Lake Geneva, of blue netted bunting fluttering in the wind, with a backdrop of the blue lake and the blue sky. It felt like the landscape had opened up in a way quite important to my larger project. I know this is a photograph of mine you particularly love, and I think it’s because you recognize that it springs something open. 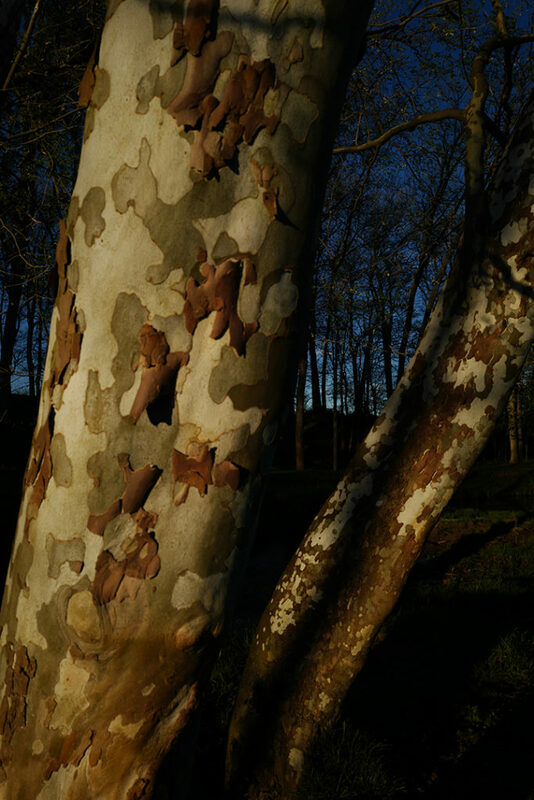 I feel that, in Night Calls, the landscape really opens with this imaginative pairing of the mottled sycamores with your father’s freckles. It’s a charged image, immensely moving but not at all obvious. It’s what Barthes would call the punctum. In any case, an answer to your question: I don’t know which comes first. I have a mental archive of possible photos and an actual archive of already existing photos. I also have bits of writing I’ve already set down, and I have notions of what I might possibly write. All of this visual and literary material is sort of floating around in my mental orbit. (It gets crowded out there.) Then the rest is a kind of space walk. I join this literary fragment with this photo, I let this other photo draw out these unwritten words, I take this quote and go out for a walk with my camera. When there’s a pair that could work, I bring them together with a silent click, and then gently lower them out of orbit and let them fall rapidly to earth. That’s how it was with Punto d’Ombra, over the dozens of pairs. Developing that sense of what belongs with what, what furthers the pre-existing rhythm. And now that it’s been completed as a coherent book, having entered so deeply and satisfying into it, I feel a bit lost. Time now to find what comes next. Teju Cole is a writer, art historian, and photographer. He is the photography critic of the New York Times Magazine and the Distinguished Writer in Residence at Bard College. Italian editions of his work include Città aperta (Open City), Ogni giorno è per il ladro (Every Day is for the Thief), and Punto d’Ombra (Blind Spot). Next year, Contrasto will publish an Italian edition of his essays (Known and Strange Things). His Instagram is here. Rebecca Norris Webb has published six photography books—including The Glass Between Us, Alex Webb and Rebecca Norris Webb on Street Photography and the Poetic Image, and most recently Slant Rhymes (with Alex Webb), with an exhibition of the latter in Madrid at La Fabrica through August 31, 2017. Originally a poet, Rebecca often interweaves her text and photographs in her books, most notably with My Dakota—an elegy for her brother who died unexpectedly—with a solo exhibition of the work at The Cleveland Museum of Art. 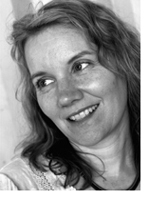 Her photographs have appeared in The New Yorker, Guardian, The New York Times Magazine, Le Monde, among other publications, and her work is in the collections of the Museum of Fine Arts, Boston, Cleveland Museum of Art, and George Eastman Museum, Rochester, NY. An exhibition of My Dakota, curated by RVM Hub, will be shown at Palazzo De Leva, Modica, Sicily, from June 24-July 16, 2017, to celebrate the Italian edition of the book, and will travel to other venues in Italy after that. Violet Isle: A Duet of Photographs From Cuba exhibition (with Alex) is on exhibit in Reggio Emilia through June 30th at Spazio Fotografia San Zenone. Her joint Instagram account with Alex is here.